It is somewhat difficult to reflect on all that transpired in the last 36 hours. There have been many other times in my life when I felt that my feet were praying, as Rabbi Abraham Joshua Heschel describes, but this was different. I arrived in Washington, DC on Monday evening and went directly to a rabbinic colleague’s family seder. As much as it was different from seders I’ve attended in the past it was also exactly the same, the beauty of Jewish ritual. It was a wonderful evening with delicious food, spirited conversation and lively singing. Though I didn’t actually want to leave, I knew that an early morning was rapidly approaching on Tuesday. 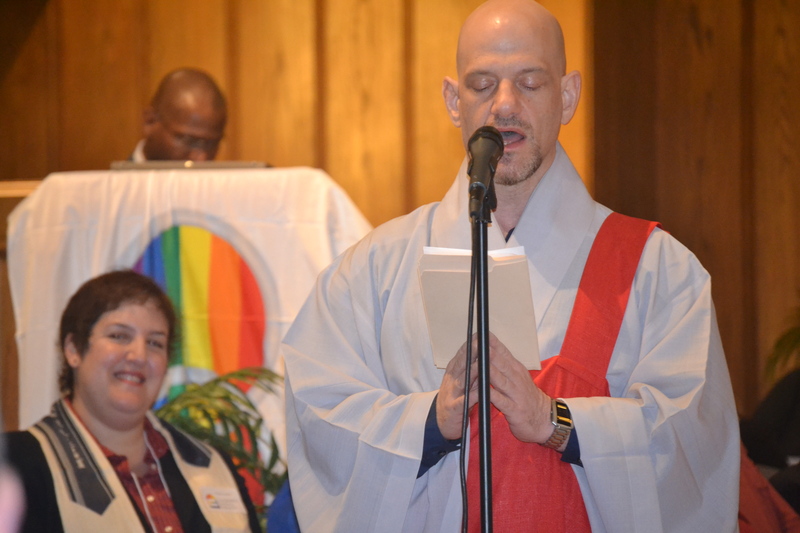 On Tuesday I was a participant in the Interfaith Prayer Service that started at 7:30am in advance of the rally at the Supreme Court of the United States (SCOTUS). The call time was 6:45 and for this Californian, that was VERY early. The service itself was wonderful. There were representatives from 15 faith groups, awesome singing and a volunteer choir. 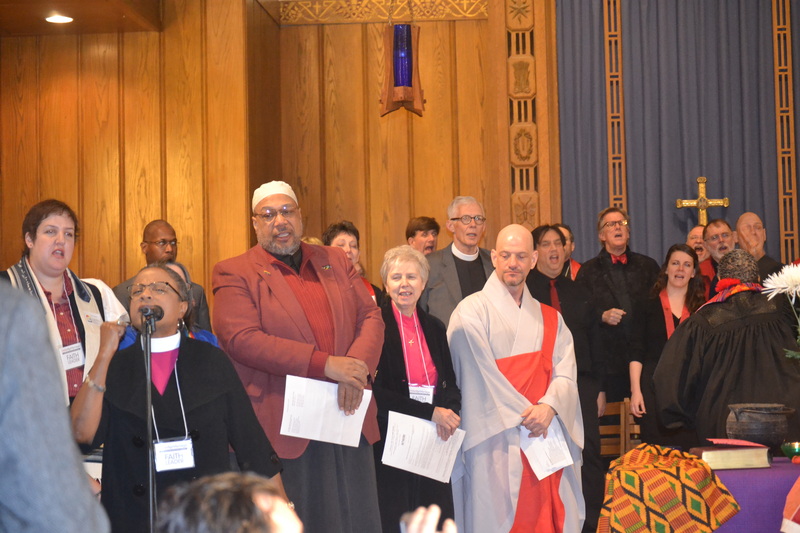 As you know, my work with California Faith for Equality started in July and I was a bit awe-struck to be participating in worship with people like Bishop Gene Robinson and fellow Californian, Bishop Yvette Flunder. In the planning for this moment, there was some worry that a service would be planned and no one would come. I’m happy to report that the church was full! 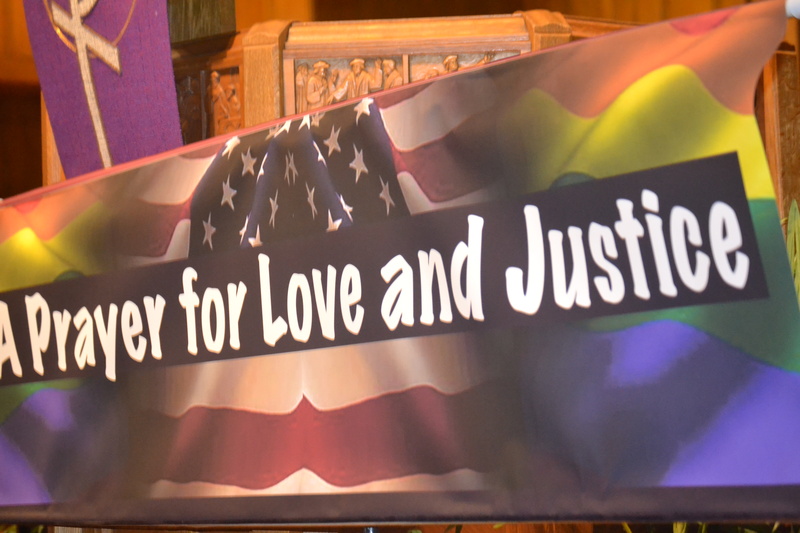 At the service’s conclusion, the faith leaders led the group to the site in front of SCOTUS where the rally was taking place. Somehow I ended up in the front holding the banner (I hope to find some pictures somewhere) and was grateful for my coat on a crisp, clear DC morning. 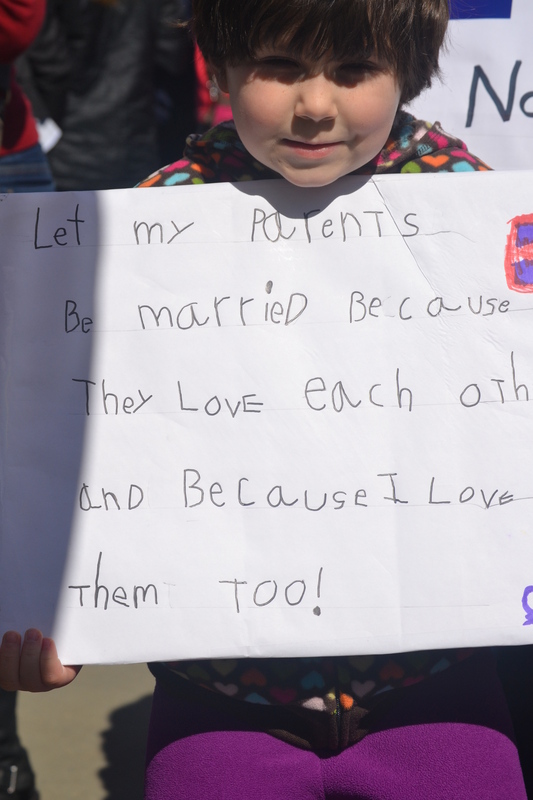 There were thousands of people outside rallying for marriage equality. 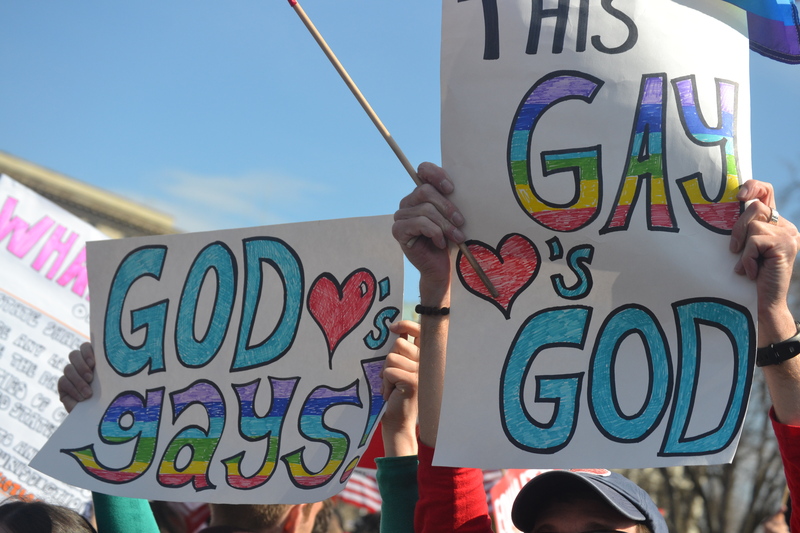 The call to wear red clearly was in effect and there were a wide variety of signs in support of the freedom to marry. It was all a little overwhelming! 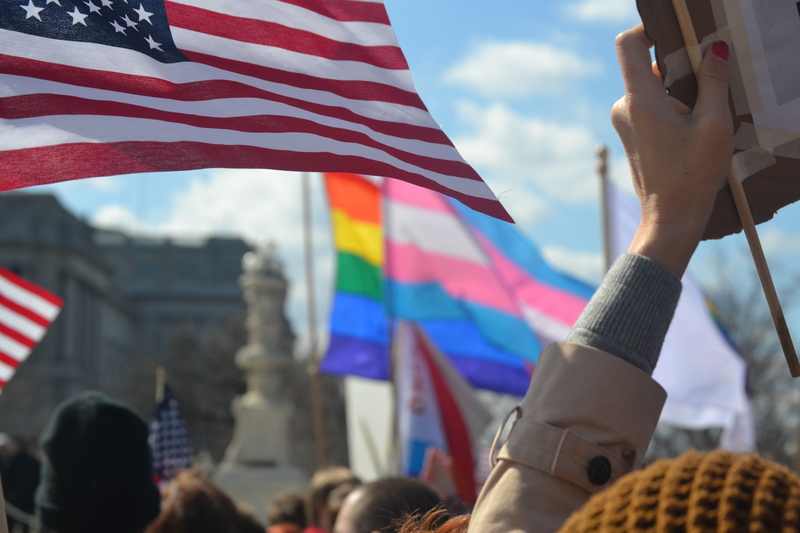 The only moments of contention occurred when those against freedom to marry marched through (this was a transparent plan and the capital police were prepared as were the marriage equality organizers). I describe the scene and you can see it for yourself in this vlog. I didn’t take any pictures of the opposition (though you can see a lot of what was going on twitter (see the history for @rabbisteinman), California Faith for Equality’s Facebook page (that you should ‘like’ while you’re there), and at California Faith for Equality’s Instagram. There were several moments when the crowd went wild. 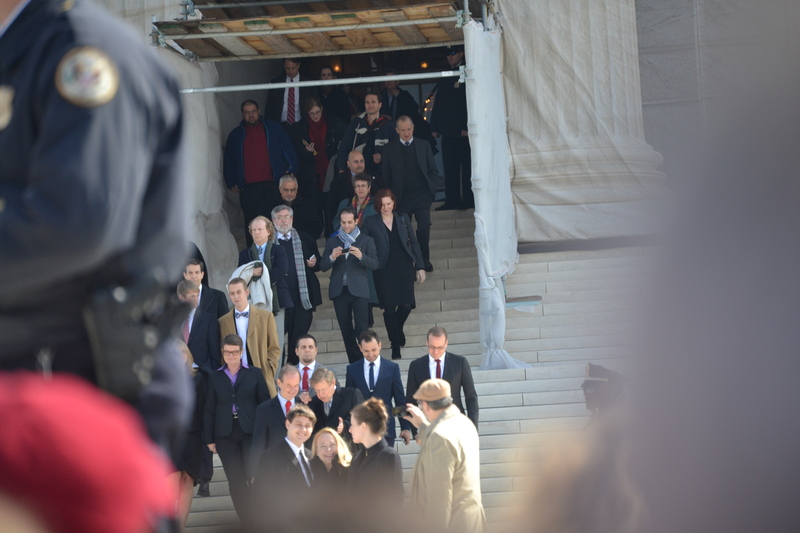 One of the most noticeable being when the plaintiffs and attorneys exited the court. I tried to capture a few pictures. 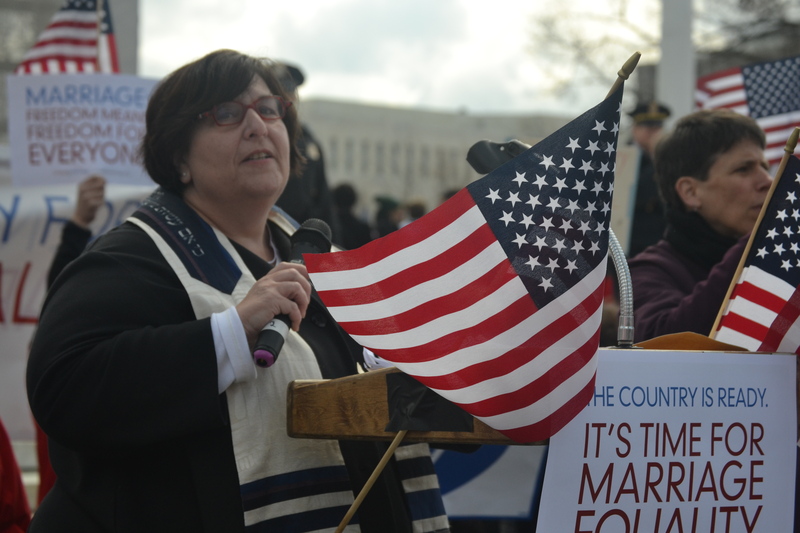 One of the rally highlights for me personally was hearing Rabbi Denise Eger’s passion-filled words that beautifully linked the messages of Passover to the moments we were living. 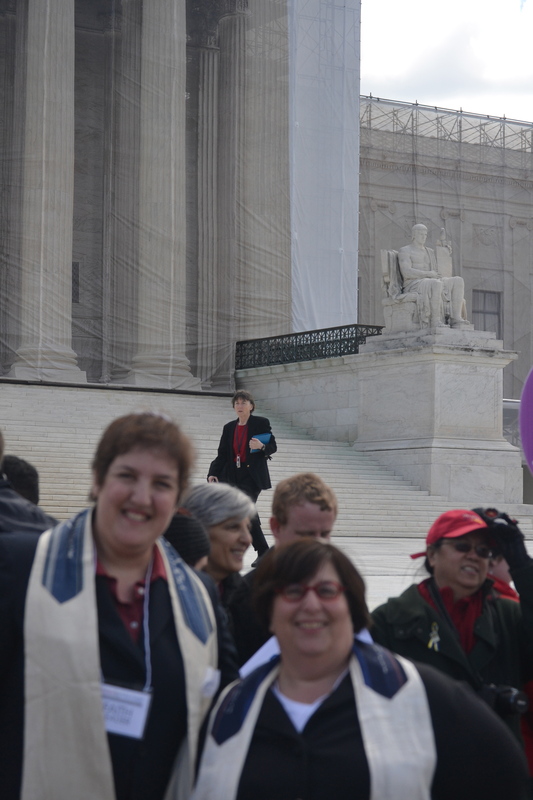 It was no accident that SCOTUS hearing Prop 8 and DOMA occurred on the first two days of Passover. You can hear Rabbi Eger’s words here. Many people came up to me or when we passed by one another they wished me a “Chag Sameach, a Happy Passover.” (I was wearing a prayer shawl (tallit) and kippah). Many of my rabbinic colleagues were not able to necessarily attend the rally because they were leading Passover morning worship services at their synagogue. I’m grateful to be in a position where I could worship God and celebrate the Exodus from Egypt by participating in the great liberation movement of our day. 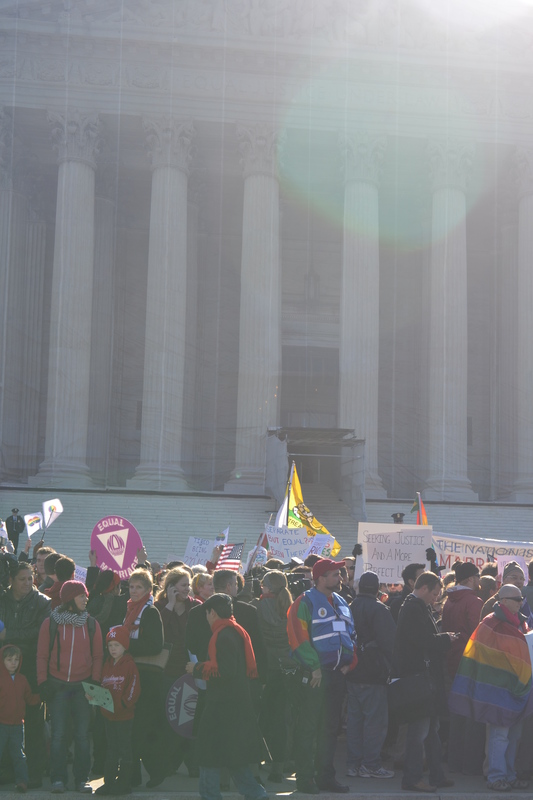 Whatever the nine justices of the Supreme Court rule, the freedom to marry and the end of DOMA is coming. After a few hours of rest and updating social media, it was time to head over to Parting the Waters: A Prop 8 Passover at the headquarters of Human Rights Campaign. 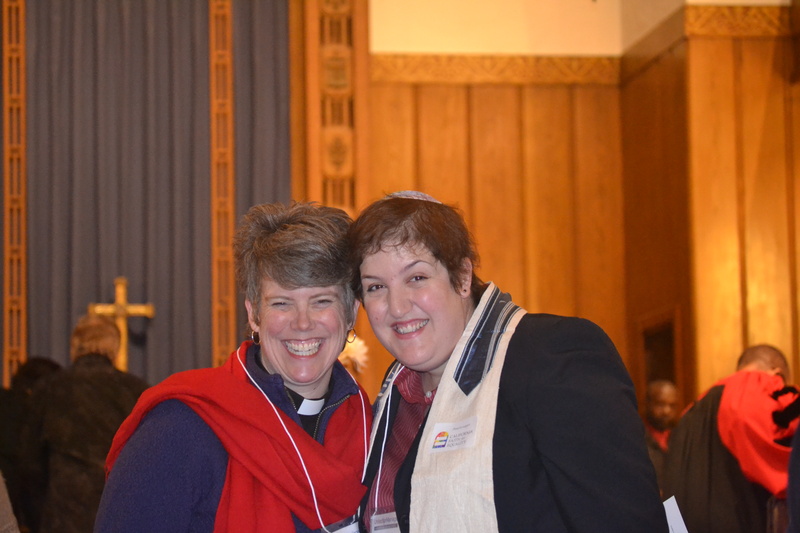 I had the privilege of leading this Seder with Rabbi Denise Eger! 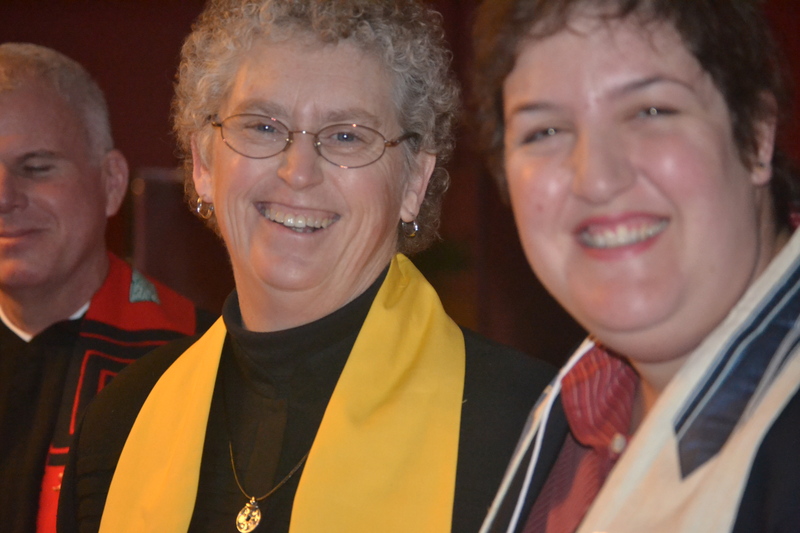 A small group of people ably led by Joanna Blotner put together this unbelievable evening. Knowing the confluence of Passover and the SCOTUS cases, Joanna saw this as an opportunity to link the clear themes of the exodus from Egypt to the freedom to marry. She and her committee put together a unique haggadah (prayerbook for the Seder meal), and invited faith leaders and anyone interested. The room was packed with at least 110 people and I know there was a waiting list! For some, this was their first-ever Passover Seder experience. There were so many highlights to the Seder, a variety of faith-leaders leading readings and participating, the celebratory vibe in the room, the number of young adult Jews participating (any 20-30s event planners dream), and perhaps the best–the only child in the room able to find the afikomen (there was also a baby) actually found the afikomen! I didn’t take a lot of pictures of the seder (I was busy leading it) but people were tweeting along! Check #partingthewater for all of the fun! And though Tuesday was chock full of events, there was another rally on Wednesday! 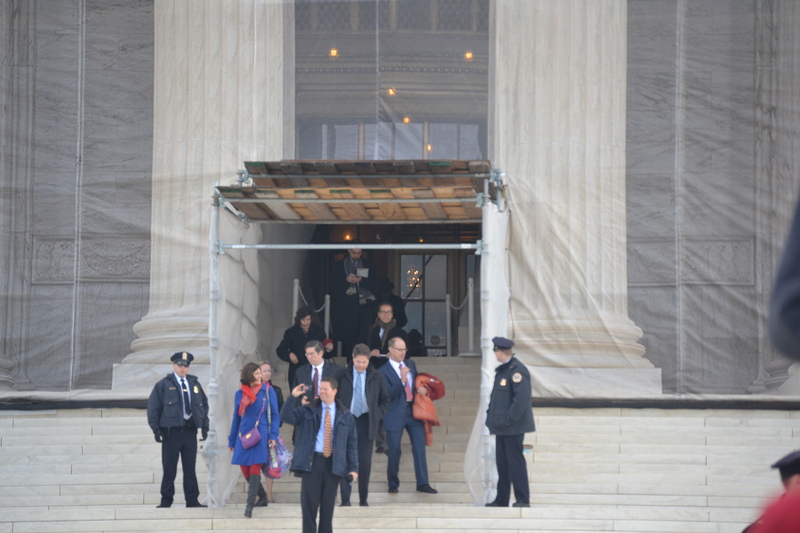 After a good night’s sleep (believe me it was MUCH needed), I made my way to SCOTUS. 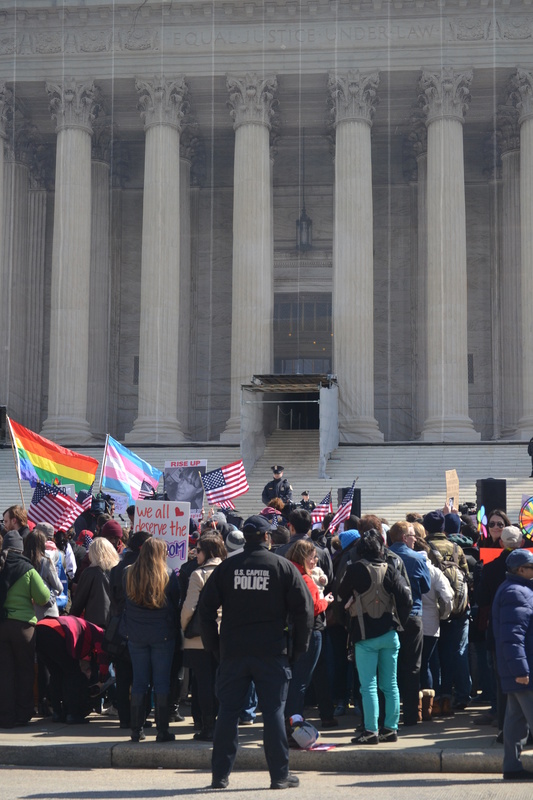 Wednesday’s rally against DOMA was also packed and so interesting in different kinds of ways. It was an even colder, crisp morning and the energy of the crowd was high. There were a variety of speakers and lots more signs of support. Many people that attended seder recognized me and said ‘Happy Passover’ and wanted to engage about the work that we all do together! It was awesome. After the rally, I grabbed a bite to eat and made my way to the airport. As I sit on the plane, I am joined by two of the plaintiffs of the original Prop 8 case, Jeff Zarillo and Paul Katami. I can’t imagine a more fitting end to this Passover journey. 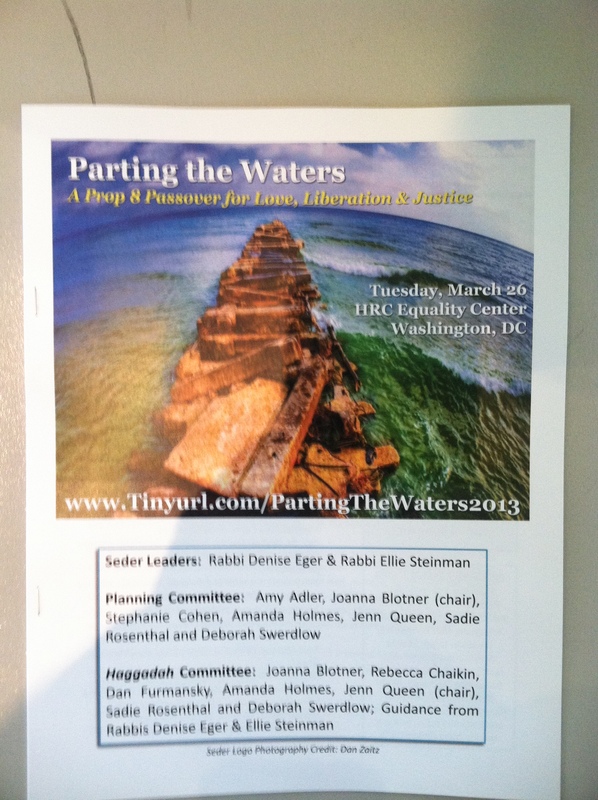 This entry was posted in tzedek and tagged about me, holidays, LGBT, politics, social justice, women rabbis. Bookmark the permalink. 1 Response to What did you do for Passover?